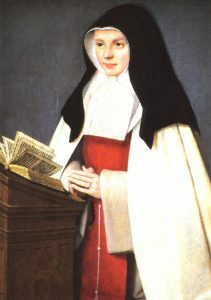 The 16th-century portrait of St. Joan of France allegedly painted by J. Perréal. “May people who see them also behold Mary still living in this world” (Statuta Mariæ, II, 101). How to show on the outside – to manifest to our brothers and sisters – this Marian way of life, which is so profound and modest and able to open hearts to Jesus? Joan of France puts an emphasis on fraternal love that must reign at the very heart of our convents. She knows that the constancy in our love for God will shine through daily trials in a totally genuine manner: “May they keep peace between themselves, reconciling those who might have disputed and excusing everyone. … May they always forgive the others their offences. … May they take no note of other peoples’ faults but always have their own before their eyes.” (Rule IX). This is not easy… but the truth is that as long as our fraternal charity, forged by courageous and continuous acts, reigns in our communities the radiance of grace, peace and joy will spread even on the outside. This is yet another fruit of the spirituality of Joan of France, which impels us all. At the beginning of chapter IX of the Rule, we find the following lines that may suggest a more outward action. “In the example and imitation of the Blessed Virgin, may the sisters perform spiritual and corporal acts of mercy in order to please Jesus Christ.” This fragment was mentioned during the revision of our Constitutions as a discreet encouragement for openness which, with regard to modern circumstances, we may live out now. The spirituality of Joan of France enlivens the Order of the Annunciade for almost five centuries because it is life, the life of the Gospels as lived out by Blessed Virgin Mary. It remains engaging and dynamic because the Holy Spirit that inspired St. Joan continues His work. Thus, young people visiting the Annunciade observe us and ask questions, as do the individuals and groups that we receive, as well as the neighbors and friends of our convent who await the help of fraternal prayer. What do they say? Just this: “Of course, your way of life is a mystery to us, but what really gets to us is the atmosphere of peace and joy reigning in your convent; what’s your secret?” How can we answer that? This is a fact and definitely a manifestation of what our Foundress desired. Interior of the chapel in the church at Lignières that contains the effigy of St. Joan. This is the very place where the child Joan received an inspiration that before dying she would found an Order dedicated to the honor of the Blessed Mother. Saint Joan received instructions from the exceptional pedagogy of the Holy Spirit, which is a dynamic pedagogy. Saint Joan’s Rule is not a collection of precepts: it is unique in the history of religious orders. All of the ten chapters open with a description of a specific virtue of Mary joined by an evangelical testimony; to what she thought, said or did by the inspiration this virtue. Its practical aspect for us is to awaken for the supernatural, to open to love and to act in concrete circumstances influenced by grace in thoughts, words and deeds, practicing the very virtues of Mary. It is impossible to divide the actions of grace and of our own endeavor, because both are needed. Thus, the flexibility and ease of love for all things in face of everyday circumstances, which fully existed in Mary, gradually begins to be realized in us. Summing up: the contemplation of Mary’s life makes us live out her inner life and develops in each one of us a desire for love that finds its active manifestation in everyday life and blossoms as a profound peace and joy. Was it not St. Joan herself who expressed this desire: “May the sisters serve Christ and Mary in joy and peace,” – this is the secret of the paschal mystery of “death and resurrection” that purifies and sets free. When St. Joan writes in her Statutes: “May the sisters live the life of Mary,” it was after she already experienced in her life what she was proposing. Being told at the age of seven that she would found a religious order in Mary’s honor, she waited for 30 years for the providential hour, satisfying herself with her fate as a wife and a women ridiculed but steadfast, valiant, serene, and doing merciful deeds. The silence of Joan unites with the silence of Mary – this ardent silence that followed the words Ecce Ancilla Domini. This is the silence of total confidence in the Word of God, the silence that advises us and becomes the silence of our convents. Observing Mary and St. Joan, living their life, we desire to realize our vocation as Annunciades. Our present day mission as nuns, is first and foremost contemplation and the striving for our ideal through prayer, work, and communal life as well as practicing the Marian virtues and counsels formulated by St. Joan. Our life of prayer in its proper sense consists of about five hours. “Let this be your wisdom, that is a wisdom above all wisdom, to know how to praise God,” said St. Joan. These few words express perfectly the value that she attributed to giving praise to God – the primary mission of her nuns. It is obvious, that today work in convents is totally different from the times of St. Joan. Great vigilance is needed in order to preserve the balance between prayer and work. Daily we must take responsibility for the assigned remunerative work and the stresses caused by keeping the deadlines. Outside the regular work and various responsibilities, our disposability is often taken advantage of according to unforeseen requests and needs of the moment. Doing all this we try to persevere faithfully in our vocation as Mary living in charity. 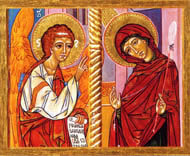 In the spirit of the Visitation and the desire to be accountable to the invitation of St. Joan: “Sisters are to perform good works within the Church and the Order,” we undertook several initiatives such as: showing hospitality to prayer groups as well as groups of children and young girls. With authentic hearts, words and deeds are ordered similarly, as a spirit of peace and mercy. Whenever necessary, procedures for reconciliation and reparation give us strength and new impetus. The 17th-century picture symbolically depicting the main charismatic features of the Annunciade Sisters: devotion to the Eucharist and the Passion of our Lord as well as to the Most Blessed Virgin Mary in the mystery of her Annunciation. 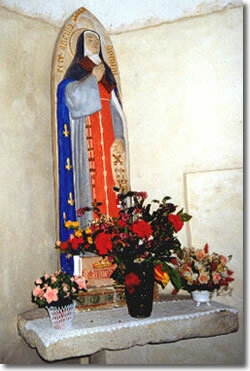 Located at the convent of the Annunciade in Thiais. What kind then, would be the solitude of an Annunciade after the example of Mary? It is not so much an actual isolation as rather a great inner attention to the Holy Spirit. It is especially a constant intimacy with Christ, the intimacy, which St. Joan sums up in one sentence: “May they seek their pleasure and consolation in Jesus alone.” What a radical solitude and yet so alive and joyful! 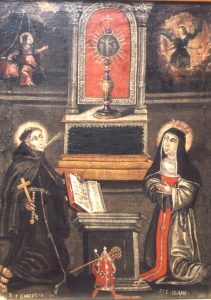 It is radical because it realizes itself in everyday life by constantly gazing on Christ with patience, silence as well as service, according to the example of Her, “who kept all these things, pondering on them in her heart.” Thus, solitude is truly asceticism, courageous and purifying, perpetually renewing itself in faith. It is joyful and alive, that genuine solitude animated by Christ, it is the source of inspiration and understanding, just like Mary departing in haste to her cousin Elizabeth to serve her. All this is done in a spirit of peace. “May the sisters take care of keeping peace between themselves; may they always forgive others their offences, excusing them all and making them always advocates of peace” (Rule IX). Wouldn’t it be possible then to discreetly radiate Mary’s life in the heart of the Church and the world, if we make our convents the centers of peace and fraternal love? • THE ORDER OF THE B.V.M.